“This remarkable collection is a ‘must-have’ for serious collectors and/or lovers of great piano playing. 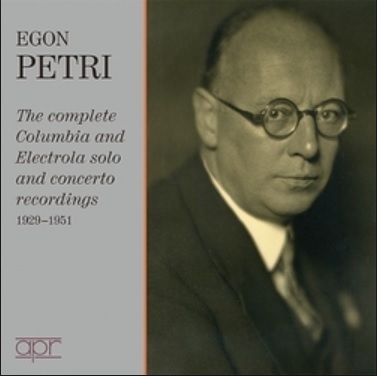 Egon Petri was perhaps most well known as a disciple of Busoni, but was in fact a pianist of enormous talent and an extremely broad repertoire. This compilation of all his electrical recordings for Columbia and Electrola covers both his prime years and some that show a bit of a decline but still have much to offer. It is not easy to summarize in writing what it was that made Petri’s playing special. He was born in Germany, but of Dutch parents (and retained his Dutch citizenship). His father was a violinist, and concertmaster of the Leipzig Gewandhaus Orchestra under Nikisch. He studied composition, piano, violin, and theory (the latter under Felix Draeseke). The Petri family knew and interacted with Brahms, Joachim, Clara Schumann and Busoni. While all of that sounds like the foundation of a fairly conservative and classical training, Petri also studied with Teresa Carreño, a flamboyant Venezuelan pianist (and composer, and singer, and conductor). Listening to the freedom that she displayed on the piano rolls she left, one hears both an incredible technique and a strong counterbalance to the more classical influences. Add the influence of Busoni, himself somewhat conflicted between his German and Italian sides, and one can see how it is that Petri was able to display a phenomenally flashy technique without ever himself seeming like a superficial showman. It is that balance between what we might think of as contrasting or conflicting elements that fascinates us as we listen to his playing. What seems particularly unusual is Petri’s ability to play with extraordinary clarity of texture while at the same time maintaining a pearly legato and an exquisitely shaped singing line. 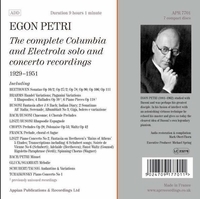 His 1929-1930 Electrola recordings and 1935-38 English Columbia discs represent some of the finest recordings in his discography, and they comprise the first two discs in this set. The Liszt Paganini Étude and ‘Gnomenreigen’, and perhaps most of all the Liszt transcription of the ‘Spinning Chorus’ from THE FLYING DUTCHMAN are utterly remarkable. The clarity of the playing, the perfectly balanced articulation of each note, all done with apparent spontaneity and a gorgeous legato, and giving the impression of being made up on the spot - all of these elements imprint these performances in the memory. In the Liszt transcriptions of Schubert songs, whether in this 1929-30 batch or the later 1951 American Columbias, are impressive for Petri’s ability to draw a real singing line out of what is, after all, a percussion instrument. While fully engaging with Liszt’s imagination, the shape and mood of the Schubert originals always remain. His early Beethoven Sonata recordings (Nos.14, 24, 27 and 32) were made for English Columbia between 1935 and 1938, and his choices reflect his serious bent. Aside from the ever-popular ‘Moonlight’, one would not find the other three on anyone’s list of Beethoven’s most performed and recorded piano works, especially at that time. Petri’s playing in all four works again reflects that balance of contrasting elements. The rubato and dynamic variation in the ‘Moonlight’ Sonata is extremely subtle, but always present. The evenness of the trills in the 32nd Sonata is a model of technical accomplishment, and what really grabs us in all of these works is Petri’s ability to balance voices, to relate harmonic motion to the ebb and flow of the music. His phrases are shaped with a natural sense of musical breathing. His two orchestral recordings from the group of English Columbias are at the same level as his solo recordings, and the LPO under Leslie Heward goes along for the ride in Liszt’s Second Concerto and ‘Fantasia on the Ruins of Athens’. Petri also demonstrates an ability to make the music smile in the RIGOLETTO and FAUST Paraphrases. He knows that these are virtuoso showpieces and doesn’t slight that element, but he also again (as with the Schubert transcriptions) shapes the vocal line gorgeously. He takes real risks in ‘Mazeppa’, and while some missed notes result, the performance does have its thrills too….The American Columbia recordings suffer from a slightly more muffled acoustic, although the restorations (done by Brian Crimp, Seth Winner, and Mark Obert-Thorn) are first-rate. 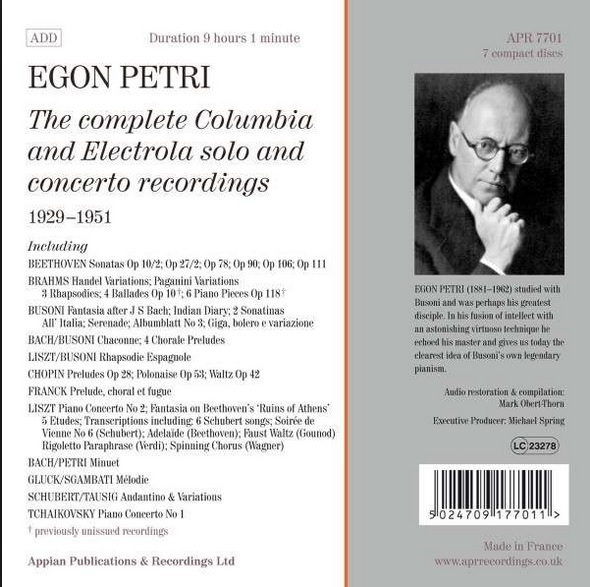 One would not, perhaps, associate Petri with Chopin, and his set of the Preludes suffers from a rather colorless acoustic, but in fact he plays them beautifully, with some surprising touches of rubato and with dynamic shifts that are quite wide but perfectly judged. He takes some real risks in, for example, Prelude #7 in A and #10 in c-sharp minor, with a more pronounced rubato than one usually hears, but because he never loses sight of where the music is going - it works. There are some discoveries here - recordings of Brahms previously unissued (for no apparent artistic reason). Petri’s balanced approach suits Brahms perfectly, bringing together elements of rhapsodic freedom with a clear sense of architecture and shape. Perhaps the most impressive recording of his later years is the 1951 American Columbia of Beethoven’s ‘Hammerklavier’ Sonata. He was to record it again for Westminster about four or five years later with better sound and his technique still remarkably intact, but this recording can serve as a definition of the adjective ‘monumental’. Petri’s uncanny ear for balance and color, his ability to judge perfectly the right balance between different musical voices and lines, all are on display here. In the remarkable performance of the slow movement, Petri demonstrates utter control over the music’s motion and draws the listener inside the music in a way that very few pianists could ever manage.